The Reading Workshop presents another book talk, this one by Kasi for all of the fantasy fans, and especially those that love Harry Potter. To see all of the book talk videos, you can visit The Reading Workshop Book Talk Wiki page. Beth shares a book talk for all of you fantasy lovers. Watch as she describes Ella Enchanted written by Gail Carson Levine. To see all of the Reading Workshop book talk videos, you can visit The Reading Workshop Book Talk Wiki page. If you enjoy fantasy, fly into Beth's recommended book, Ella Enchanted. Hey Kathy Schrock, How About Share and Share Alike? Recently a site linked to my Student Blog Rubric. I am always pleased when someone finds something of value on this blog. In fact, one of the greatest benefits of blogging is the sharing of ideas and opinions among bloggers. All items on this blog, The Reading Workshop are licensed through Creative Commons. This allows anyone to use anything of value with attribution. ©1995-2010 Kathleen Schrock. All rights reserved. Probably the easiest thing for them to do is just blow me away, never link again, and pretend I don't exist. However, the just thing to do would be to share and share alike. So there is no misunderstanding, please feel free to use anything you find of value on this site. I would appreciate attribution. Please see the link below to answer any questions. If you are a sports fan, this book talk shares a book you might really enjoy. Jake is discussing Travel Team written by Mike Lupica. This is the latest in the series of book talks by students in The Reading Workshop. To see all of the videos, you can visit The Reading Workshop Book Talk Wiki page. Thanks Jake for sharing a book with a great story! Students in The Reading Workshop are continuing to share their book talks. To see all of the videos, you can visit The Reading Workshop Book Talk Wiki page. In this video, Madison shares one of the most exciting books ever written, Chasing Yesterday, Awakening written by Robin Wasserman. This three book series is filled with adventure. Thanks for sharing Madison! I was reading The Thread That Runs So True again recently. As I read this novel, a couple of Jesse Stuart's thoughts hit home. He discussed the inequalities of education in eastern Kentucky in the early 20th century. As a teacher in a district dealing with a building levy failure, and facing the challenge of getting an income tax levy passed again, I couldn't help but wonder how we could have come so far, but have so far to go. 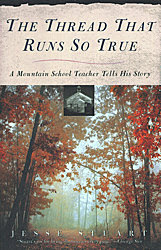 In this autobiography, Jesse Stuart tells of his life as a school teacher in rural Kentucky in the 1930-40's. The book focuses on his efforts to make positive changes in education and the influence good teachers can have on their students. Many of the stories are funny, others a little sad as he tells of the challenges his students face to become educated. I couldn't understand why a child born in the city or town should have a better education than a child born among the valleys or on the hills. Why shouldn't a boy at Sassafras, Kentucky be as well educated as a boy in Boston or Manhattan? It seems to me, the democratic public school system needed some democratic reforms. As I read this, I thought about the 100 year old building that my students come in to every day. The one where they walk down three flights of stairs to the basement to go to the bathroom. Where the floor in the gym has broken tiles and waves like the ocean on a breezy day. While in every surrounding district, in every direction, student go to school in brand new buildings, with large rooms, and every convenience. I love the state of Ohio because the people move. They do things. They don't wait. They believe in progress. And at this time it was debatable whether Ohio or California rated tops in the nation's schools. I love teaching at Laurelville. The teachers I work with are unbelievably dedicated. The staff wants to be here. And the students are absolutely the best. They work hard and achieve with amazing success. But, after reading Jesse Stuart's stories from 70, 80, and even 90 years ago, I can't help but wonder, where is the equality in education? Why do students all over the state and the country have new buildings? Why do students in so many other schools have the latest technologies? Do the students of Laurelville deserve any less? In dramatic fashion, Hadley shares her thoughts about one of The Reading Workshop's favorite books this year. Enjoy her book talk about Dairy Queen written by Catherine Gilbert Murdock. Thank you for the exciting book talk of a great read Hadley! Students in The Reading Workshop are continuing to learn and progress with their efforts of sharing their video taped book talks. Our hope is to build a video library that students can browse as they search for a book to read. In this video, Hannah Hop shares one of her favorites Takeoffs and Landings by Haddix. Thanks for sharing a great book Hannah! Students at The Reading Workshop are going to begin recording book talks whenever they read something that they want to recommend to their peers. Hannah was courageous enough to volunteer to be the first to have her video posted online. The videos will be hosted at Schooltube. In this book talk, Hannah shares Found written by Margaret Peterson Haddix.